Drop off the little ones at Kids Quest, challenge your tweens and teens to the newest arcade games in Cyber Quest, hit up your favorite restaurants, then wait 30 minutes and play in our amazing hotel pool before retreating to a luxurious room even kids can appreciate. Feast on a gourmet selection of seafood every Friday at High Mountain Buffet located in Coeur d’Alene Casino. The menu has everything to satisfy from oysters, clams, scallops to king crab and much more. The buffet runs from 3:30 to 9:30 PM and is $35.99 per person or $28.99 with Coeur Rewards card. What's better than free breakfast after a restful night’s sleep? Book a Mountain Lodge standard room at Coeur d’Alene Casino and enjoy breakfast for two at High Mountain Buffet or Red Tail Bar & Grill (depending on venue hours). This offer is only available Sunday-Thursday and begins at $114.99 with the promotional code: HIBREGWIN. This offer is subject to availability and exclusions apply. Enjoy a wide-range of one, or all, of the six restaurants and lounges at Coeur d’Alene Casino, a night in a Mountain Lodge standard room and two Pub & Grub t-shirts. The Pub & Grub Winter package includes a $40 dining credit Friday-Saturday or a $50 dining credit Thursday-Sunday. Deluxe room upgrades are available for $40 extra per night. Prices start at $149.99 with the promotional code, PUBGRUBWIN. This special is available from November until the end of May and is subject to availability. Exclusions apply. Coeur d’Alene Casino is stoking up the barbecue every Saturday from 4:00 – 9:00 PM at High Mountain Buffet for a meal you won’t forget. Featuring slow smoked beef brisket, barbecue spiced blackened chicken, raspberry chipotle barbecue pork ribs, grilled kielbasa and peppers and much more. The barbecue buffet is $21.99 for adults. The Kalispel Golf and Country Club is giving golfers a taste of Spokane’s most historic course with the Stay and Play. Celebrated since 1898 for its competitive challenge and impeccable care and beauty, this course, nestled along the Little Spokane River, is where the region’s most passionate golfers call home. Complete the perfect golf day with a luxurious stay at our AAA Four-Diamond and Forbes Travel Guide Four-Star rated resort. And experience the thrill of Vegas-style gaming and the finest dining, spa and nightlife Spokane has to offer. to and from the course. Service based on availability, and advanced shuttle reservations are recommended. *Based on double occupancy. Hotel reservation and tee time reservation are based on availability. Restrictions apply. Room fees not included. Take a culinary trip around the world at Coeur d’Alene Casino’s International Flavors Buffet. Set for Sundays from 4:00 - 8:00 PM, feast on Swedish meatballs with egg noodles, Italian style Tuscan salmon, manicotti with alfredo, sweet and sour pork, Mexican taco bar, New England style clam chowder and more. Complete the journey with an assortment of cakes, pies and an ice cream bar. The buffet is $21.99 for adults. Prime Rib Special is back every Sunday at Chinook, Steak, Pasta & Spirits. Indulge in a half-pound of prime rib accompanied by delicious veggies, mashed potatoes and a choice of a house or Caesar salad. Enjoy dinner for $17.99 or $13.99 with a Coeur Rewards card. As a thank you to the men and women of our country that have served or are currently serving, Coeur d’Alene Casino offers discounted rooms. This package includes one night in a Mountain Lodge standard room along with a food and beverage credit, valid at any open food and beverage outlet. Prices start at $124.99 Sunday-Thursday with a $40 food credit, and $129.99 Friday-Saturday with a $30 food credit. The offer can only be redeemed using a valid military, police or firefighter identification card. This special is available from November until the end of May and is subject to availability. Exclusions apply. Develop your leaders... build leadership capacity across your organization! GO Beyond's 2019 Leadership Summit, a place where leaders Go Beyond… take the next step in their leadership journey. Lead with impact! Discover greatness and expand their leadership influence! Participants will learn from expert speakers while engaging in interactive discovery, rich collaborative discussions, and reflective thinking. Every participant at Go Beyond’s Leadership Summit will leave inspired, equipped and energized to “go beyond” their current effectiveness, expanding their influence, strengthening their agility, maximize their impact, equipped to deliver great results. You will not want to miss this opportunity to develop yourself and your leaders. Seating is limited to 100 to create a rich professional collaborative learning environment. Seats are filling quickly. 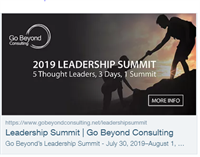 Registration today and save 17% on Go Beyond's 2019 Leadership Summit ($75 discount plus the early bird discount of $300). Adorkable Flowers and Gifts offers year round member discount of 15% off of any purchase in store or over the phone. This discount is not to be combined with any other offer, discount or coupon.